The STATIM 2000 was specifically designed to sterilize handpieces quickly and gently - inside and out. 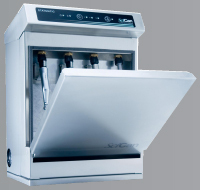 The STATIM 2000 employs a fully removable cassette, allowing for aseptic transfer of instruments directly to the point-of-use. As the world’s most widely used autoclave for handpiece sterilization, the STATIM 2000 sterilizes instruments between procedures for reduced instrument investment and increased efficiency. Like all STATIMs, the 2000 incorporates an advanced microprocessor that automatically maintains optimal sterilization conditions for each cycle, from start to finish. Unlike many common conventional autoclaves that utilize open door drying, the STATIM’s sealed cassette allows for closed drying without compromising the load during the cycle. STATIM 2000 can dry a load of pouched instrument in as little as 10 minutes. All you need for the mid-sized practice. The perfect blend of speed and capacity for the growing practice, the STATIM 5000 features a cycle as fast as 9 minutes with a sterilization chamber approximately three times the size of the 2000 model. This larger capacity cassette provides rapid high volume throughput sterilization with cycles up to four times the speed of common conventional autoclaves. The STATIM’s one-touch keypad offers a choice of four fully automated sterilization programs. Unlike many common conventional autoclaves that utilize open door drying, the STATIM’s sealed cassette allows for closed drying without compromising the load during the cycle. STATIM 5000 can dry a load of pouched instrument in as little as 15 minutes. The newest member of the STATIM family features the most exciting innovations in the industry. Dental practices can now enjoy all the advantages of a chamber autoclave combined with next generation STATIM technology. The newest addition to SciCan’s autoclave family, the Bravo fractionated vacuum chamber autoclave, continues the SciCan tradition of being at the forefront of innovation and technology. Bravo is a fractionated vacuum sterilizer that incorporates both pre-vac (to remove air) and post-vac (to help drying) cycles to ensure perfect steam penetration for any load*. Bravo is true to the Statim® reputation for speed, providing rapid cycles for unwrapped instruments. Why Use An Automated Washer? The advantages of automated washing systems over traditional manual cleaning are recognized by the CDC and independent research and testing organizations. If it's not clean, it can't be sterilized. SciCan offers the tabletop HYDRIM C51w instrument washer and the newly redesigned floor model HYDRIM L110w to meet the needs of your dental practice. Protect your staff against the hazards of skin puncture and aerosolized contaminants from manual or ultrasonic washing, manual rinsing and manual drying. Spend more time in revenue-generating work with patients, rather than scrubbing instruments. HYDRIM'S powerful circulation pumps and wash arms, combined with SciCan's HIP chemical, result in exceptional cleaning performance. HIP chemical is a proprietary blend of surfactants (Surface Acting Agents), which are substances that reduce the surface tension of the water and increase its ability to lift debris from instruments. Your valuable instruments are cleaned and protected with HIP! 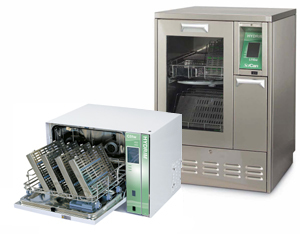 Ensure that every set of instruments receives the same validated cleaning process, without the variability inherent in manual scrubbing and ultrasonic cleaners. A precise amount of liquid cleaning solution is dispensed automatically, without the clumping associated with powder detergents. In contrast with ultrasonic cleaners, in which the water is reused for a day or more, HYDRIM uses fresh water for each cycle. 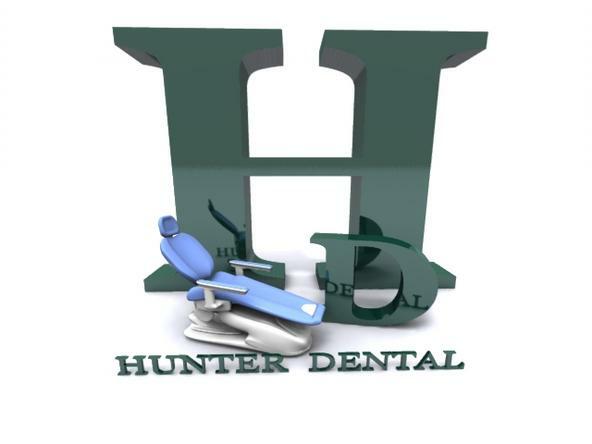 Automated equipment is recommended in "Guidelines for Infection Control in Dental Health Care Settings - MMWR 2003"
Using automated equipment can be safer and more efficient than manually cleaning contaminated instruments. Accommodates your current instrument management procedures and your future growth plans. STATMATIC is the automatic care and maintenance system for up to 3 dental handpieces of your choice, plus their chuck mechanisms. STATMATIC optimizes working procedures in your practice and plays an important part in cleaning, protecting and maintaining your valuable instruments. In a matter of seconds, after every treatment, they are properly cleaned and lubricated prior to sterilization. A new wave breakthrough provides 99% pure, fresh water. Protect your patients and your Statim Cassette Autoclave® by using only pure, fresh water in your practice. SciCan's AQUASTAT distiller allows you to forget about buying expensive bottled water or risking damage to your equipment from less than pure distilled water. A patented distillation technology kills harmful bacteria and viruses by flash vaporizing water and then reconstituting it through condensation. The result is water that's 99% pure. So pure, you could even drink it! AQUASTAT purifies soft or hard water from any source including those that are spring fed or municipally piped. Simply plug it into any outlet, fill with tap water and switch on. Safely and effectively it will remove lead, copper, aluminum, arsenic, iron, nitrates, herbicides, pesticides, PCBs and more! 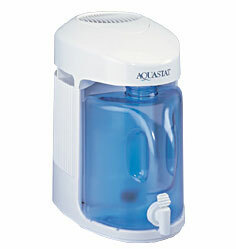 With its energy efficient technology, AQUASTAT purifies 3.78 litres (1 gallon) of water in just 4.25 hours. 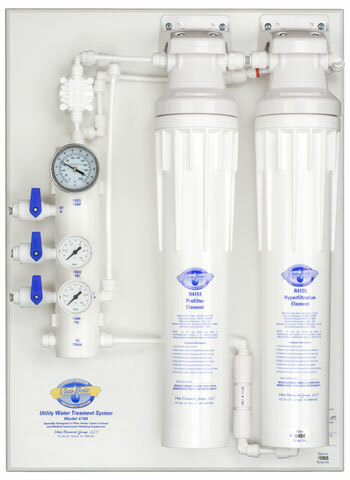 Combine this fast process with a compact, light-weight design that doesn't require any special plumbing or wiring - and you'll have all the fresh water you need. * Helps prevent damage to instruments. Specifically designed to filter water used in today's medical & dental instrument washers. Completely non-electric - operates on city water pressure. Reduces water contamination in wash water by as much as 95%. Reduces total dissolved solids, chlorides and traces of iron.